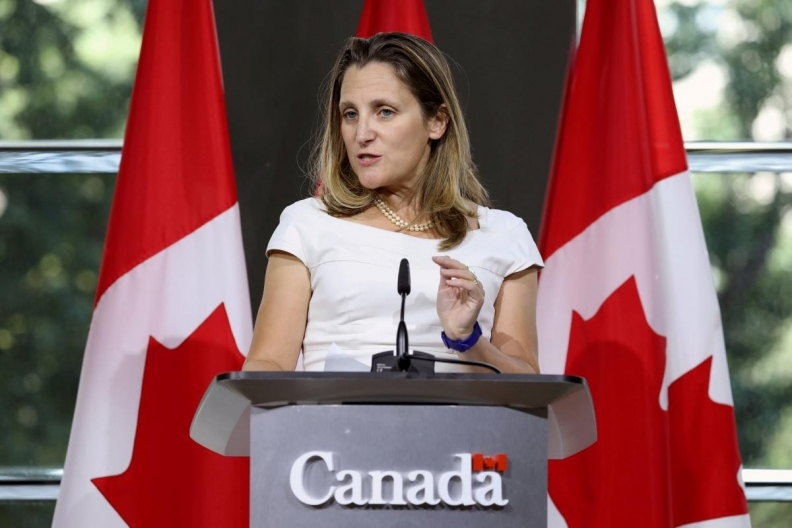 WASHINGTON — Foreign Affairs Minister Chrystia Freeland is back in Washington — and back in search of a way to bridge the divide that's keeping Canada out of a new North American free trade pact. House of Representatives majority whip Steve Scalise (R-La.) is warning of "growing frustration" on Capitol Hill with what he calls Canada's "negotiating tactics." "While we would all like to see Canada remain part of this three-country coalition, there is not an unlimited amount of time for it to be part of this new agreement," Scalise said in a statement. "Mexico negotiated in good faith and in a timely manner, and if Canada does not co-operate in the negotiations, Congress will have no choice but to consider options about how best to move forward and stand up for American workers." "From the outset of these modernization negotiations, Canada has been extremely co-operative," Freeland said Tuesday. "Canada is very good at negotiating trade deals. Canada is very good at finding creative compromises. We have been extremely engaged." Negotiators have been working "extremely hard" and are committed to doing the necessary work to reach an agreement, she added — but they aren't about to settle for just any agreement. "It is our duty — it's my duty — to stand up for the national interest and I will always do that." Trump, for his part, sounded a familiar note, accusing Canada of having long taken advantage of the U.S. even as he sang the praises of his country's northern neighbour. "We love Canada. We love it," he told a news conference. "Love the people of Canada, but they are in a position that is not a good position for Canada. They cannot continue to charge us 300 per cent tariff on dairy products, and that's what they're doing." Ottawa has privately expressed frustration with Mexico's decision to go it alone last month. But one source familiar with how the negotiations have progressed, speaking on condition of anonymity in order to discuss details freely, says Canada transgressed first with a surprise auto proposal last spring. Mexico still wants Canada in a three-way deal — so much so that the language in the deal with the U.S. was written to facilitate a trilateral agreement, the source said. And Mexico feels their agreement works in Canada's favour on a number of fronts. While Canada has been pushing for wording in NAFTA aimed at strengthening labour protections and gender equality, the overall negotiations are said to have stalled over Canada's insistence that an agreement contain an independent dispute-settlement mechanism. Prime Minister Justin Trudeau has also vowed to protect Canada's so-called supply management system for dairy and poultry products against U.S. demands for greater access by its farmers to Canada's dairy market. Sources say Canada has offered some limited concessions on access while also ring-fencing the system itself. A spokesman for Trudeau tweeted late Tuesday that the prime minister had spoken with Trump to convey his condolences on the loss of life from hurricane Florence, which has left 37 people dead in three states. Cameron Ahmad wrote that the two leaders also discussed the ongoing NAFTA talks, with Trudeau reaffirming "his commitment to a deal that works for both countries." Supply management has been a big issue in the provincial election campaign in Quebec, home to about half of Canada's dairy farms. Quebec Liberal Leader Philippe Couillard has warned there will be "serious political consequences" if there is any further dismantling of the protections for dairy farmers through NAFTA negotiations. "The rumblings around Washington have been Canada may attempt to push any deal beyond Oct. 1, largely due to the Quebec election," said Dan Ujczo, an Ohio trade lawyer with Dickinson Wright. "Rep. Scalise is putting down the marker that these are real deadlines."